Our usual early morning wake up when we are visiting the family consists of two cute kids staring at me as I sleep.... I never have to set an alarm! LOL :) Brian went to help our friends unload their moving truck, assemble their pool table and hang a bunch of art/photos/etc at their new house for the day. My brother-in-law went to do some work. My sister and I took the kids up to Apple Hill in the morning. It was a little rainy, but I absolutely loved that it felt like fall up there this weekend. Of course, we started our trip off with a stop by Starbucks for coffee, then headed up to High Hill Ranch. We got some doughnuts, hit up the candy store for some treats (chocolate covered gummy bears for her, candy corn for Creighton, gummy worms for Abby, fudge and a caramel apple for Brian & I). Got a mix of apple varieties and some apple cider. Checked out the craft booths. Another stop at Boa Vista orchard on the way back to grab some berry turnovers (blueberry and blackberry) for Brian. Stopped at Safeway to grab lunch and dinner. Headed back to the house to hang out... we got there and the sprinkling rain turned to a down pour with a thunderstorm! We used the afternoon to teach Creighton to play Candy Land (he killed us at the game!) and made Abby's 3rd birthday invitations. So much fun! Mom & Dad came over for dinner. Mom, Dad and I took on Creighton at Candy Land after dinner (Dad won this one!) and they headed home. Brian got back late and ate leftovers. The kids attacked him when he came in. :) After they went to bed, Katie, Kile, Brian and I watched Hangover II. So funny! Loved spending so much time with the family today. It was a great day! Abby watching me put together her birthday invite... "It's Stuffy!" "It's Lamby!" "It's Doc!" "Is that for me?" "It's special!" SO CUTE. And Creighton learning to play Candy Land... he loved it! A good move for him often ended in "booyah!" haha :) He's also gotten very good at Angry Birds (currently he loves the Star Wars version the most) and Where's My Water on my phone. 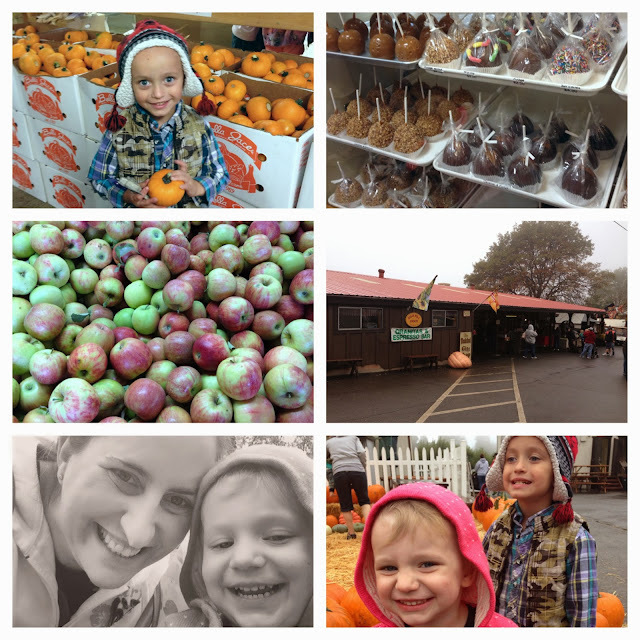 The kids at Apple Hill -- they had so much fun even though it was raining. Love spending time with all the family! Sounds wonderful! It's been years since I've been to Apple Hill. Time for a visit! thanks for all the blog love today! :) i love that you blog all those memories. such a great way to condense all of the good stuff that happened. cute pics too. we plan on heading up in that direction sometime in the next couple of months, or at least i hope so. haha.